Tennis Ball T Shirt.com - Now Stop Snoring! Do you Snore? Do you have Sleep Apnea? Does someone you live with Snore? There is hope! I set up this website after a number of friends and family members heard that I had been able to put a stop to my snoring using the old “Tennis Ball in a T-Shirt” trick. It’s simple: a tennis ball on the back of a t-shirt prevents you from sleeping on your back, and in some people that prevents snoring...as many relieved spouses have learned over the years! 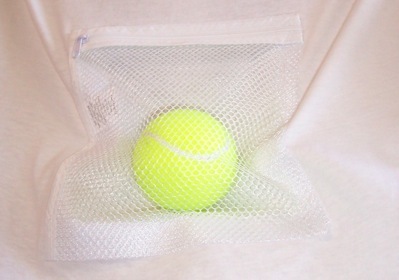 People asked me where I had purchased a T-shirt with a pouch on it for a tennis ball to use as anti-snore nightwear. When I told them I couldn’t find one “off the shelf” and had to sew one up for myself, several asked me if I could make one for them as well, to see if it might help them stop snoring too. That got me started, and due to popular demand I can now provide a shirt at a great price for anyone who would like to give this popular, inexpensive anti-snoring technique a try, while sparing themselves the hassles and needle pricks needed to put the “equipment” together. I can’t promise this snore-no-more method will work for you, but it did for me; I now get a much better night’s sleep and feel more rested when I wake up. So it’s worth a try, right? And my full refund guarantee if you don’t like the shirt when you receive it means you have nothing to lose but another good night’s sleep to see if this simple, natural snoring remedy works for you! Give the simplest anti-snoring trick in the book a try! People all over the world say they have used this “snore no more” trick effectively to help them stop snoring and sleep better! 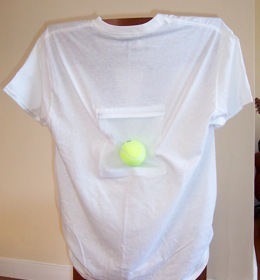 Let me send you (or the snoring partner who is keeping you awake) a “Tennis Ball T Shirt” today for just $19 + shipping. Those who snore are often keeping themselves and others from getting a good night’s sleep, so do yourself and him or her a favor and see if this simple anti-snoring trick works for you. You may find you start waking up more rested and refreshed than you have in years, as I did. At just $19, it’s so affordable you can’t afford not to at least give it a try! And it makes a great, fun gift for that special snorer in your life! Click here to order securely via PayPal or by Visa/MasterCard.